Everyday Beauty: Hello and Welcome! I'm so glad you stopped by, and I want to welcome you to the fresh new look of Everyday Beauty. My friend Hope did beautiful, clean and detailed design work for me, as she always does, and I am tickled....well, pink! 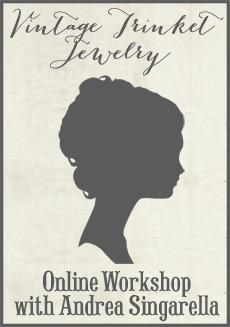 I've been wanting a site that combines my shop, blog, photos, and other little bits of my life, which is the reason why www.andreasingarella.com was created. There are some new jewels in The Shopette and a new collection of Prize Ribbon Rosettes as well. Simply click "Shopette" in the menu bar above to take a peek. Please note that all new orders will begin shipping on May 4th. Some of the Bookmark Baubles featured in the Country Living article are also for sale. One more thing...I am happy to be shipping internationally once again! I have missed my international friends and customers, and will now ship to Canada, Europe and Australia through First Class International mail (which will keep the rates lower for you). Thanks so much for your support and excitement. It's always such a joy to hear from you and share pieces of my world with you! OMG Andrea, it is so so so beautiful. I cannot wait to attend your class at "ONCE UPON A DREAM". Your creations are FABULOUS. I'm going to check it all out right now. I looooooove the new look. It is so beautiful. Hope did a fantastic job. My goodness, the new site is beautiful. Hope does amazing things doesn't she? I have been eyeing your necklaces for so long and this new batch of lovelies are my favorite so far. And btw, what a treat to open my Country Living to find your beautiful bookmarks. Congrats! congratulations on becoming a dot.com, it all looks very lovely. but then I knew it would! I love your new blog look, it's so pretty! The soft, pretty colors are so you. And your new shopette is beautiful!! Andrea, the new site is absolutely beautiful! Hope is so talented! Congratulations on the Country Living piece - the bookmarks are lovely! Andrea, I love the new look. So pretty, and sweet, and FRESH and light. Beautiful, just like you. Love your new site....so Pretty! Sorry i missed you last month. i will see you in October! I can't even describe how much I love your blog and now it is even more lovely. Just shared it with new customers. It's splendid. p.s. I might be a little jealous of all those who got one of your gorgeous bookmarks. I popped over to buy some and I was too late. Lucky girls. It is just lovely, Andrea. What you have created takes "center stage." Also, everything you have cteated is beautiful. Thanks for sending me the lovely ribbon rosette award. I can't wait to give it to my friend! I love the new look, Andrea. Beautiful! Congratulations. If you love two persons, select the second; Because you will not love someone else if you truly love the first. Don E. Mann is an online producer for the Daily Press and loves to dance. When he's not spending time with his wife, Conni, and 9-year-old daughter, he's probably teaching martial arts and pretending he's George St. Pierre or reading a good book. He also really, really likes soft sugar cookies. i agree with howard that mr eseban has done a miracle. his gardens have proved to be very useful as they have become a community center, summer camp, and urban food oasis, is no exception.